The V2G now makes it a snap to change your safety eyewear to dust goggles. The V2G Goggles come with interchangeable headbands and standard temples. Pyramex V2G Goggles feature vented lens and frame to increase air flow. 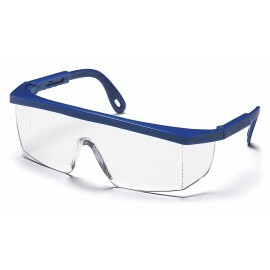 Lenses are treated to prevent fogging and self seal small scratches. Lenses also provide 99% protection against harmful UV rays. 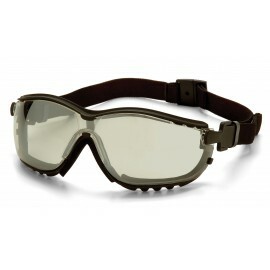 These Pyramex V2G Goggles provide superior impact protection and all-day comfort! The 9.75 base curved lens offers complete side protection. Available in clear, indoor/outdoor, gray and amber lenses. Perfect for outdoor activities such as paintball, boating, and hunting. 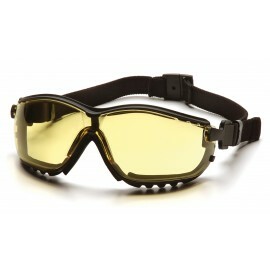 Pyramex V2G Goggles exceed the ANSI Z87.1-2003 High Velocity Impact Standards. Corneal Abrasion is a scrape of the outer surface of the eye and is the most common eye injury. These are usually rather painful, but not serious. Blunt Injuries happen when an object impacts the eye, causing sudden compression. Depending on the force with which the object struct the eye, complications can include swelling and bruising (a "black eye"), bleeding of the eyes, or even damage to optic nerve. Penetrating Injury is when a foreign body punctures or pierces the eye. These injuries are severe, and require immediate medical attention.